This is a book about predicting the future. It describes my attempt to master a small enough corner of the universe so as to glimpse the events of tomorrow today. The degree to which one can do this in my tiny, toy domain tells us something about our potential to foresee larger and more interesting futures. Less prosaicly, this is the story of my twenty-five year obsession with predicting the results of jai-alai matches in order to successfully bet on them. As obsessions go, it probably does not rank with yearning for the love of one you will never have or questing for the freedom of an oppressed and downtrodden people. But it is my obsession, one which has led me down paths which were unimaginable at the beginning of the journey. This book marks the successful completion of my long quest, and gives me a chance to share what I have learned and experienced. I think the attentive reader will come to understand the worlds of mathematics, computers, gambling, and sport quite differently after reading this book. The Joys of Jai-Alai - Jai-alai is a spectator sport and gambling venue which is under appreciated and misunderstood by the public. I'd like to acquaint a new audience with this fun and exciting game; and whet the interest of current fans by making them more aware of what determines the outcome of each match. If you stick with me, you will learn the best way to watch jai-alai, and bet on it. The Power of Mathematical Modeling - Mathematical models govern our economy and help forecast our weather. They predict who will win the election and decide whether your mortgage should be granted. However, the man on the street knows little about what mathematical models are and how they work. 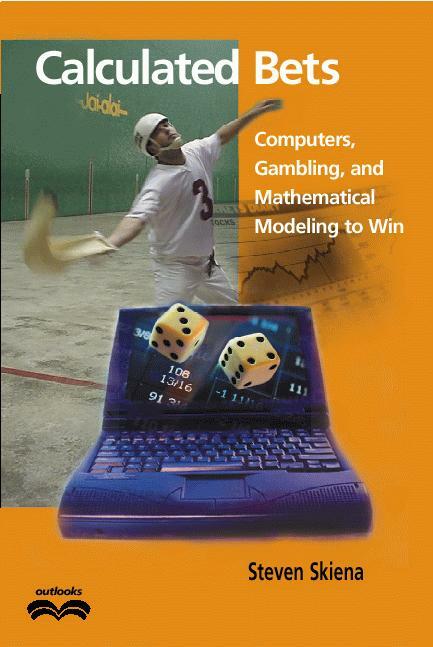 In this book, I use our jai-alai system to explain how mathematical models are designed, built, and validated. The Mathematics of Money - Gambling and mathematics have a long and interesting history together. I'll discuss other gambling systems, both successful and unsuccessful, for such games as lotto, roulette, blackjack, and the stock market. Indeed, my jai-alai system functions very much as a stock trading system in miniature. You will learn how program trading systems work, the future of Internet gambling, and the real reason brokerage houses don't offer mutual funds that invest at race tracks and frontons. The Craft of Computer Programming - For most non-programmers, the ideas behind modern computing systems lie shrouded beneath a thick mist of buzzwords and technology. These buzzwords give no hint of the process by which computer programs are made to work, and the elegance and beauty which underlies the best software. In this book, you will discover how my students and I built a particularly interesting computer program. I use our jai-alai system to explain to the layman such computer science concepts as parsing and random number generation, why real programmers hate Microsoft, and the true glories of the Internet. The Aesthetics of Data - Many people don't like the looks of charts, graphs, and tables, no matter how many colors they are printed in. But done right, such data representations can be a thing of beauty, vehicles driving us to understanding the story that the numbers are trying to tell. In this book, you will get to see a variety of data sets presented in a variety of ways. You will get a first-hand look at how to interrogate numbers and make them talk. Finally, this is the story of a mild-mannered professor, who places money on the line to test whether his system really works. Do I hit it rich or end up a tragic, bankrupt figure? You will have to read to the end to see how I make out. My goal has been to produce a book which will be interesting and understandable even to those with little background in each of our three main topics: jai-alai, mathematics, and computing. I explain all the jai-alai lingo that I use, so you will be able to appreciate what we are doing even if you have never been to a fronton. If you can understand how mortgage interest is calculated, you have all of the mathematical background you need to follow what we are doing. Even if you have never programmed a computer, you will be able to understand the ideas underlying our system. Either way, you will have a better understanding of how computers are programmed and why after reading this book. Maybe you will even be inspired to try some mathematical modeling of your own! At the end of this book I suggest some possible projects to get you started. I have tried to make this book as fun to read as it was to write. In particular, I have striven to be in the spirit of Bill James, the popular writer whose books on baseball go deeply into the essence of the game. He uses advanced statistical analysis and historical research to unearth hidden trends and overturn conventional wisdom. One perceptive review of his work notes that part of the fun in reading him comes from the spectacle of a first-rate mind wasting itself on baseball. Part of the fun of this book, I hope, is the spectacle of a second-rate mind wasting itself on jai-alai.